On the 4th of July 2008 we visited the town of McCarthy and the old Kennicott copper mine at the end of the The Copper River & Northwestern Railway. Last summers 4th of July trip was to the start of the Railway at the fishing town of Cordova on the Gulf of Alaska. The first day of the trip we drove from our homes in Fairbanks to the King for a Day Campground on the Klutina River near Copper Center (#2). This is a very popular place for king and red salmon fishing. The following day we drove to Valdez and onto the Alaska Ferry System fast ferry Chenega for a two hour sail to Cordova. In Cordova we spent three days in the city owned Odiak Campground touring the area and attending their 4th of July Celebration. We then moved to the Child's Glacier Recreation Area 25 miles up the Copper River. We stayed in the Area Campground on the river right across from the glacier. This is a truly spectacular campground. 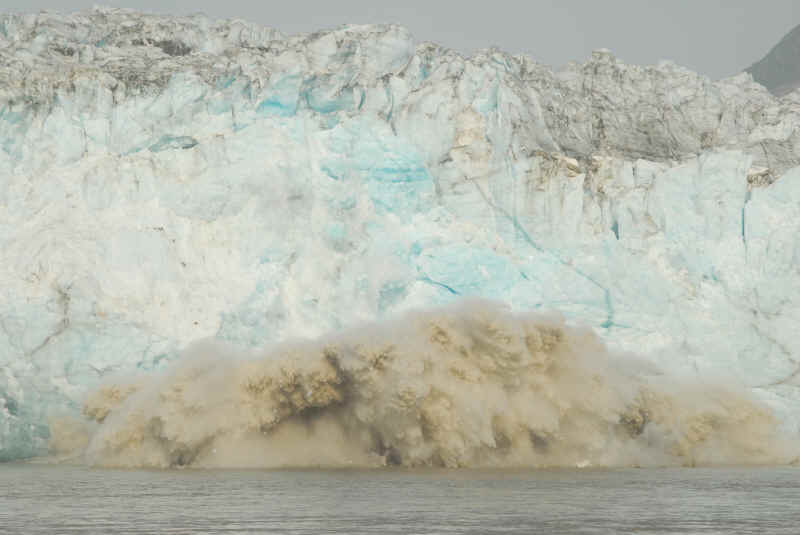 The temperatures' were in the high 70s to low 80s and the glacier was very active calving into the river making rumbling and rifle shot like sounds. We also walked across the "Million Dollar Bridge" that was built in 1910 for the railway. The next two days we stayed at the Alaska Rafters Campground (www.alaskarafters.com) 12 miles east of town. 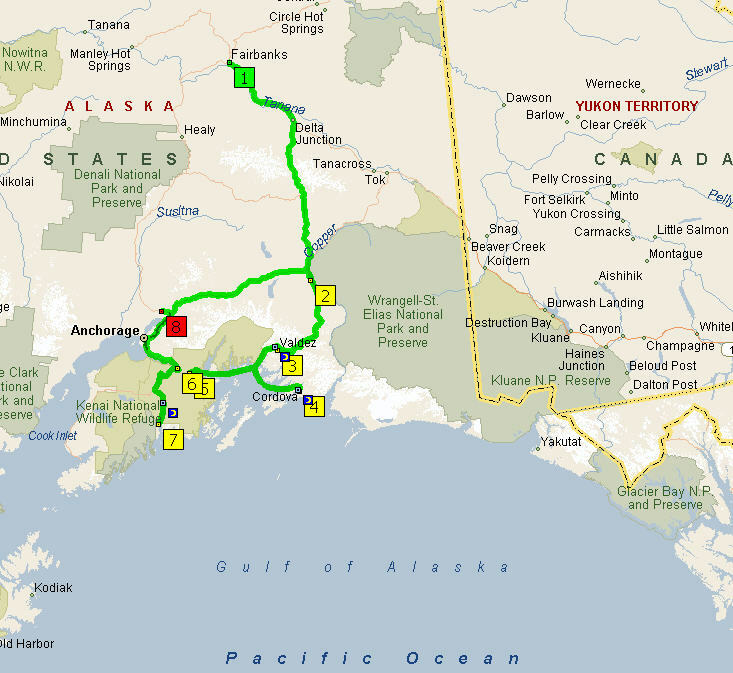 Our last night was back to Odiak and the next morning onto the ferry headed for the town of Whittier (#5). From Whittier we drove through a railroad tunnel to Portage (#6) and onto Seward (#7) on Resurrection Bay. We spent two days in a city owned campground right on the bay and then headed for Wasilla (#8) with a stop at the Exit Glacier in the Kenai Fjords National Park. After a night with friends near Wasilla we headed home. The Worthington Glacier on the way to Valdez. Keystone Canyon further on the way to Valdez. The car deck of the ferry with our rigs in a row. Our friends Brent and Susan on the ferry with the Trans Alaska Pipeline Terminal in the background. The Odiak Campground with Cordova in the background. Life is tough on the road. Main street in Cordova set for the 4th. Cordova small boat harbor. These are mostly commercial fishing boats. A pair of sea otters in the small boat harbor. Hiking with the Chugach Mountains in the background. Our main activity at the Childs Glacier, watching for calving. Tommy waited for hours to capture this one. On the "Million Dollar Bridge". The price tag for this railway bridge was a million bucks when it was built in 1910. Our rig in front of the 'Million Dollar Bridge". We didn't drive across it as the website said it was limited to lighter traffic. Tommy deep frying halibut while we "rough it"
Tommy and I unloaded so we would have wheels to get around in. The port of Whittier as we approach on the ferry. The fast ferry Chenega. This catamaran with diesel powered jet drives cruises 32 knots. Its a very smooth ride. Whittier is connected to the rest of Alaska by a 2.5 mile long railroad tunnel. It is also used as a one-way auto tunnel. Here we are waiting our turn. Camped at the City of Seward Campground overlooking Resurrection Bay. Cruise ships docked outside the small boat harbor at Seward. Wild mountain goats taking refuge from the heat. Looking back down the trail to the Visitor's Center and parking area. The End!